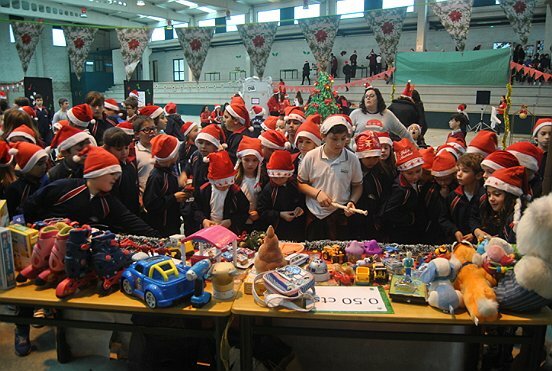 Last Friday we had our Christmas Market in which our primary students had the opportunity to buy toys, eat sweets, enjoy the festive decorations and have lots of fun! We would like to thank the families for your donations and for collaborating. We are proud to say that this year was a total success since all the toys were sold! As you know, the money raised goes to Cáritas. Every little helps. Thanks to the music teachers and our very talented students, we also enjoyed a mini Christmas concert. Primary and secondary students got together to play and sing the famous carol Jingle Bells. It was amazing! Alsp, some secondary students surprised us with the performance of Mariah Carey’s All I Want for Christmas is You. They were all wonderful!